In this week’s episode of Mad Genius Tips, F&W’s Justin Chapple demonstrates how to make Gail Simmons’s crazy-good stuffed banana s’mores. It’s a simple recipe that takes bananas to next-level deliciousness. But it’s not the only way to show off the creamy fruit in a sweet and gooey dessert. In this week’s episode of Mad Genius Tips, F&W’s Justin Chapple demonstrates how to make Gail Simmons’s crazy-good stuffed banana s’mores. It’s a simple recipe that takes bananas to next-level deliciousness. But it’s not the only way to show off the creamy fruit in a sweet and gooey dessert. Here, seven spectacular ways to end a meal with bananas. 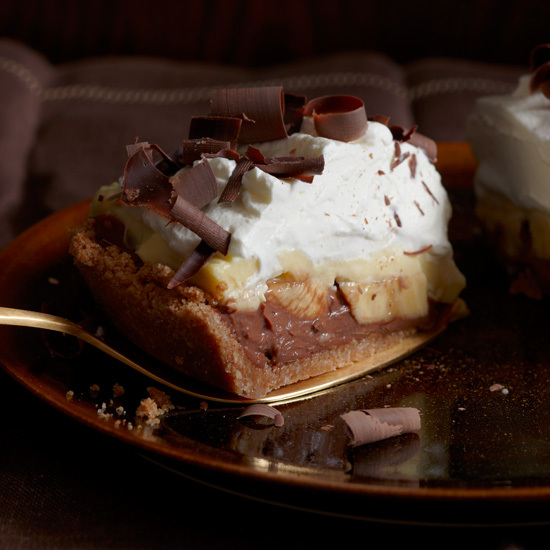 This pie marries two classic pies: chocolate cream and banana cream. For these splits, pastry chef Johnny Iuzzini marinates bananas in rum, coats them with sugar, and grills them until the outsides get hard and crackly. In this dessert, fudgy peanut butter brownies get topped with bananas caramelized in dulce de leche, scoops of vanilla ice cream, whipped cream and peanut brittle. Pastry chef Heather Ho incorporates one of her favorite Hawaiian fruits—bananas—into these warm puddings in caramel sauce. These crispy dessert spring rolls are superfast and ridiculously good. For Top Chef winner Hung Huynh’s Asian take on a banana split, halved bananas are stuffed with bittersweet chocolate, coated in a light tempura batter and fried until golden. The indulgent dessert is finished with rum-spiked caramel sauce and vanilla ice cream.